SELMA, Alabama (CNN) -- In 1965, Alabama state troopers and local deputies stopped and clubbed black activists as they marched peacefully from Selma to Montgomery. "When we topped the bridge and looked down and saw the sea of blue and the sheriff's deputies and Alabama state troopers on the other side of that bridge, then we immediately knew that there was a problem," recalls Jimmie Wallace, one of the marchers. 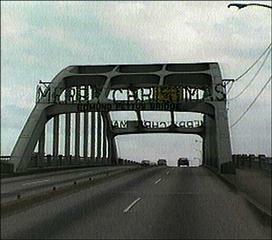 The incident is known as Bloody Sunday, and the bridge is the Edmund Pettus Bridge. Now, tourists visit the site in Selma and walk along the route the black activists took that day. Just down the road from the bridge is Brown Church, where the walk began and where civil rights leader Martin Luther King Jr. is honored. Alabama recently received a federal grant to turn the 50-mile trail along U.S. 80 from Selma to Montgomery into a formal attraction. Another site of note is Selma's National Voting Rights Museum, which opened in 1993. There, the Footsteps to Freedom Room displays photos of Bloody Sunday and the successful five-day Selma to Montgomery march, led by King. One of the photos features a picture of Miss Marie Foster and Miss Amelia Boynton Robinson, the first two people in the line of marchers on Bloody Sunday. 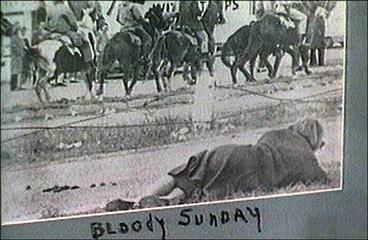 Another photo in the Selma Room shows Foster on the ground after being attacked by state troopers that day. The clothes she was wearing are displayed. The museum also houses the Reconstruction Room, honoring black congressmen elected to office just after the Civil War; the Women's Suffrage Room, with photos of black and white women who fought for the right to vote; and the Memorial Room, with photographs of blacks and whites who were killed as they fought for equality. Copyright © 1996 Cable News Network, Inc.